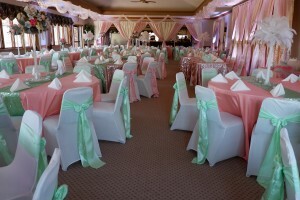 Fox Creek Golf Course is a full-service special event Banquet Facility. From small meetings to holiday parties to wedding receptions, Fox Creek is able to accommodate small groups of 12 to large groups of up to 200 guests. Take the first step in hosting your event by contacting us today. Option #1: Hourly rate: $100.00 for first hour and $75.00 per hour after that. Anytime Sunday-Thursday. Option #2: Sunday-Thursday, $300.00 (Choose any 5 hour period). Friday & Saturday, $450.00 (Choose any 5 hour period). The price includes the allocated rental time plus 2 hours guaranteed set up time, we allow additional set up time if room is available. Linens are not included in rental cost. Stop on by to see our Banquet Menu and Pricing Guide. Schedule an appointment today to visit Fox Creek Golf Course. Contact Mark Collins, our General Manager at mcollins@golffoxcreek.com.